Made of ceram and pp plastic with tube, Anti-Corrosion and non-toxic, environmental protection. Length, 4.3" / 11cm. Diameter: 1.2" / 3cm. Tube length is about 29'' / 74cm. Automatically adjust water amount upon soil moisture when you out of home. Open the green lid, wet them for 15 minutes to prepare the tips and insert the probes into the soil of your potted plants, and then place the hose ends in a water bottle. Water stakes suitable for Potted or Hanging Plants. Provide water straight to the plants roots,easy flow control means your plants receive the correct amount of water. 8 packs plant watering probes. ●Material of automatic plant watering: Made of ceram and pp plastic with tube, Anti-Corrosion and non-toxic, environmental protection. ●Plant watering device size: Length, 4.3" / 11cm. Diameter: 1.2" / 3cm. Tube length is about 29'' / 74cm. ●Easy to use: Automatically adjust water amount upon soil moisture when you out of home. Open the green lid, wet them for 15 minutes to prepare the tips and insert the probes into the soil of your potted plants, and then place the hose ends in a water bottle. ●Function: Water stakes suitable for Potted or Hanging Plants. Provide water straight to the plants roots,easy flow control means your plants receive the correct amount of water. 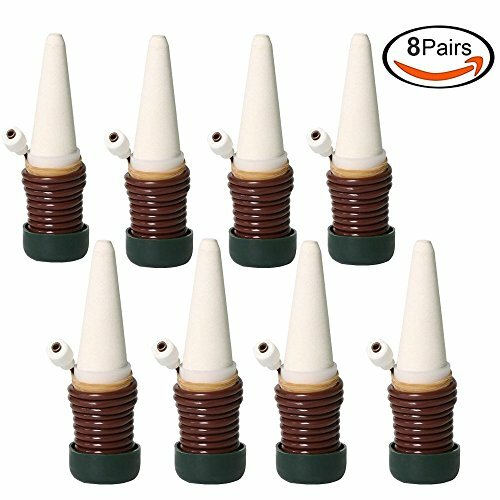 ●Package: 8 packs plant watering probes. If you have any questions about this product by Echodo, contact us by completing and submitting the form below. If you are looking for a specif part number, please include it with your message.